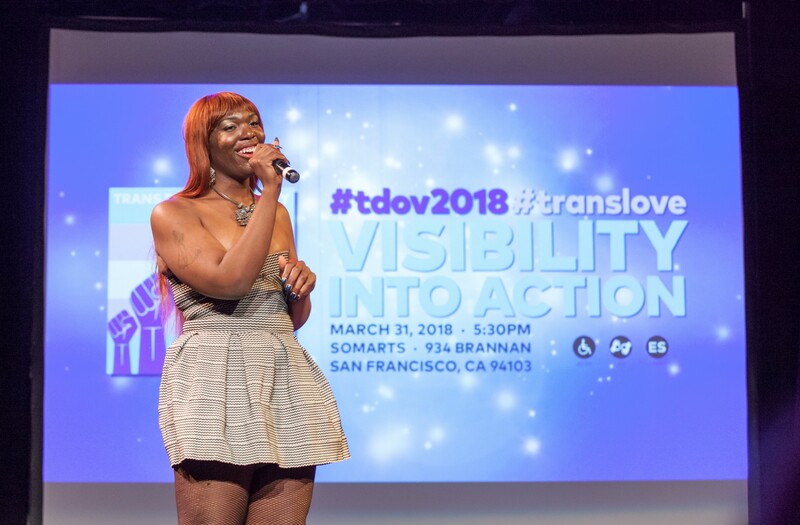 Star Amerasu, aka Ah-Mer-Ah-Su, sings at the 2018 Trans Day of Visibility in San Francisco. All photos by Pax Ahimsa Gethen, CC BY-NC-SA 2.0. 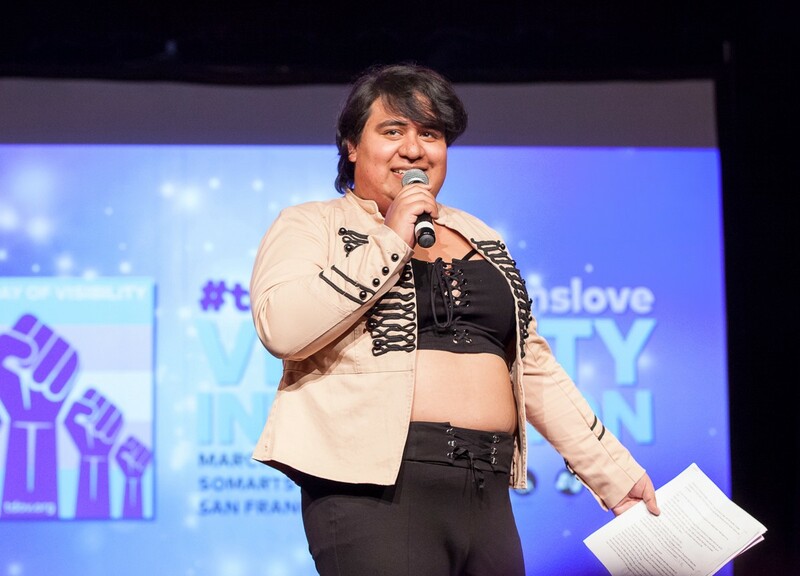 On March 31, I attended the annual Trans Day of Visibility celebration in San Francisco. 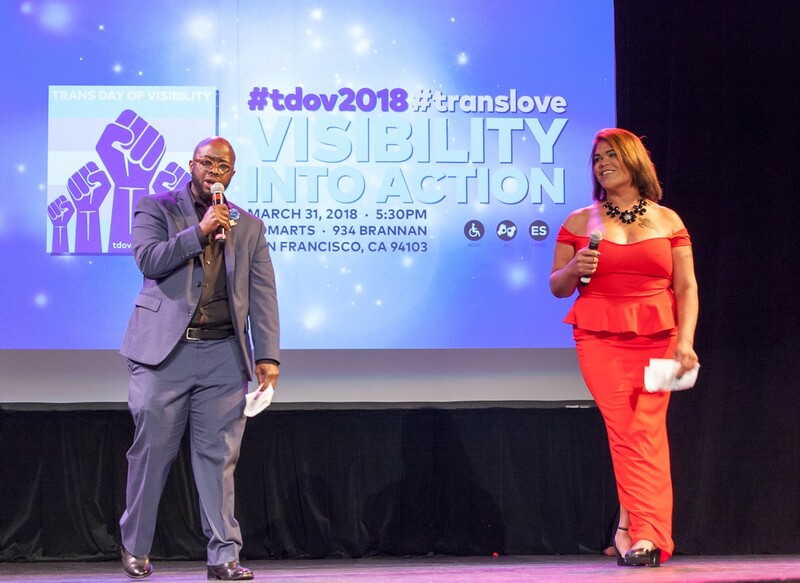 The theme for this year’s event was “Visibility into action”, recognizing that our community has to take action to counter the rise of trans-antagonistic bigotry and violence that has accompanied our increased visibility. 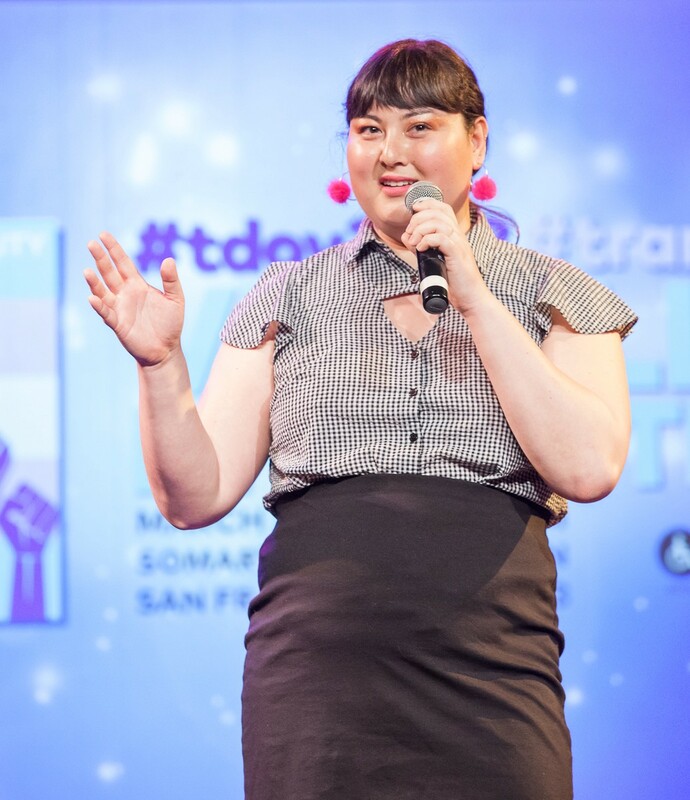 A video montage by Gwen Park highlighted trans activists speaking out over the last year, including Janet Mock, Chelsea Manning, chase strangio, Raquel Willis, Gavin Grimm, and others. Openly trans politicians who took office in 2017, including Andrea Jenkins and Danica Roem, were also celebrated. Shawn Demmons and Jenna Rapues emcee the event. Vanguard Award winner Amber Gray speaks at the event. 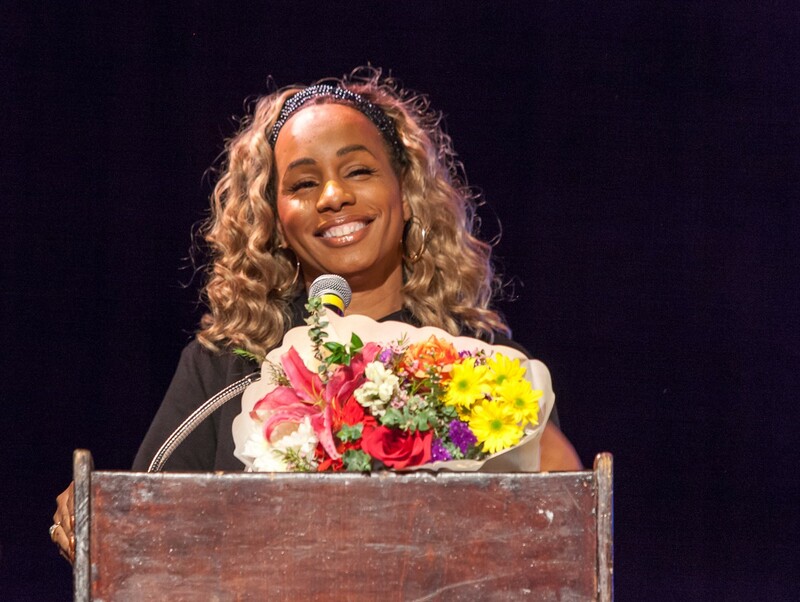 Trans visibility awards were presented to Amber Gray, Raquel Willis (who could not attend but sent a video message of thanks), and Peacock Rebellion. Members of Peacock Rebellion also performed comedy routines. Nori Reed performs at the event. Lexi Adsit performs at the event. Other performers included Star Amerasu (pictured at the top), Anand Kalra, and Davia Spain. I’d watched Star sing (with live looping) at several trans events, and also saw her and Lexi Adsit from Peacock Rebellion speak recently on the topic of trans women of color and visibility. 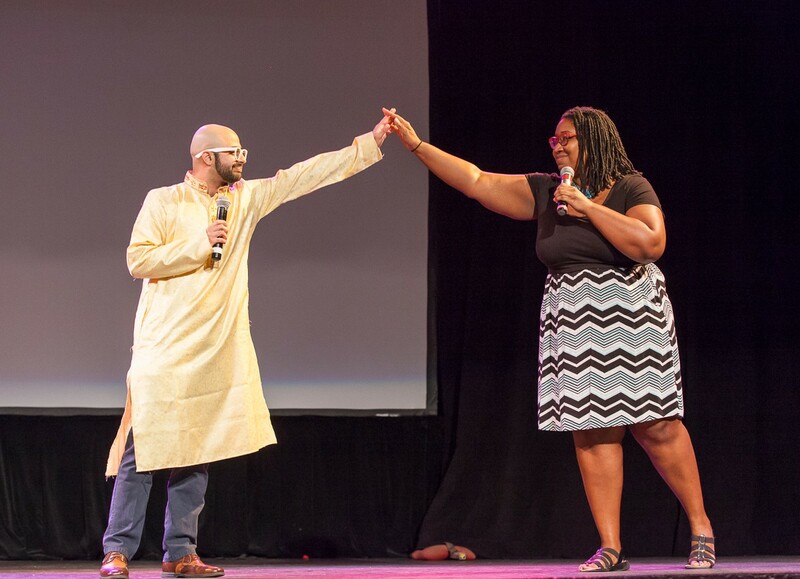 Anand Kalra and Jazmine Applin perform at the event. 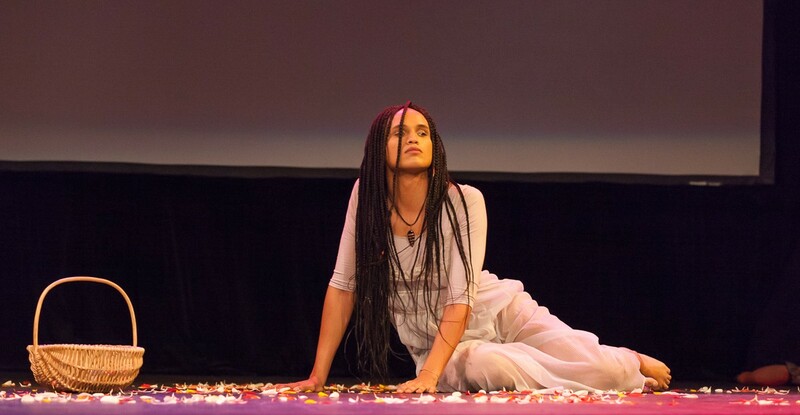 Davia Spain performs at the event. I’ve attended the three major annual trans events in San Francisco — the Trans Day of Visibility, Trans March, and Trans Day of Remembrance — for three years now. I appreciate that the organizers consistently center trans women of color, who face discrimination and violence even in this supposedly ultra-liberal city. The trans events I’ve attended have also consistently offered ASL and Spanish language interpretation, and provided accommodations for those with impaired mobility. I am grateful to those in the trans community who have the ability to be visible, and use that visibility to help others who may not have the privilege to be open about their gender identities. While I have always been open about being trans, I have struggled with wanting more people to read and share my stories about gender issues while simultaneously not wanting to attract more attention from trans-antagonistic people who take delight in hurting me. With visibility comes violence, sadly. My full set of photos from the Trans Day of Visibility is available on Flickr. Please credit me as Pax Ahimsa Gethen if you use any of my photos, thanks!